On that Friday, OpenSnap takes us to Gino's Brick Oven Pizza in Salcedo Village, a Neapolitan pizzeria with an authentic Italian taste but a product of Filipino entrepreneurs. We arrived earlier than usual and we were able to choose a good seat. The place gets crowded when the clock strikes at 12noon. The interior is very relaxed and simple, I love their triangular lighting fixture and the red brick wall accentuated by plants in a metal pail is a nice home décor idea. 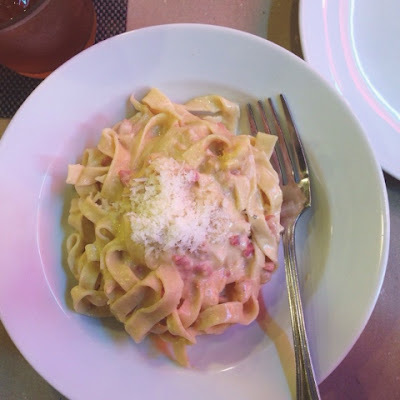 Among the pizza and pasta dishes we ordered, SMEGG and Salted Egg Pasta are my favorites. Their pizza are made from scratch and freshly served hot on the table. 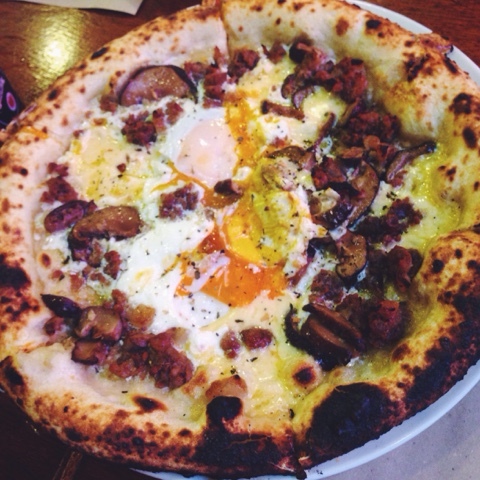 SMEGG pizza is a genius recipe, the toppings and the egg really compliments very well. I enjoyed eating the pizza with their spicy honey sauce. Their Salted Egg pasta is very tasty and creamy, bacon and salted egg is a good combination. I saw it in the picture that the pizza is so mouthwatering would you know if that pizza that has price of 370.00 is good for how many person? Hi, the pizza is good for 2-3 persons.